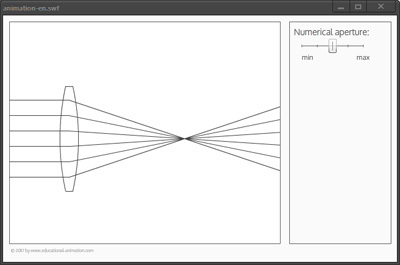 In this interactive animation the concept of the numerical aperture is illustrated. Shown here is a converging lens focusing a light beam. Depending on the numerical aperture, the light is focused on different positions. Here you see a lens focusing several parallel beams. Using the computer-generated controller, the shape of the lens and thus the numerical aperture can be changed. The appearance of the light beams is automatically updated. The numerical aperture is an important measure in judging the resolution of an objective or a lens. In the case of a smaller numerical aperture, the angle at which the light beams are focused is sharp. In principle, lenses with small aperture angles have a lower resolution than lenses with large aperture angles.